Forecasts, An analysis of exposure, Dams to combat the flood of information, Everything is relative, People like to see themselves in a favorable light, Everyone is different and Free advice - valuable tips for successful trades. 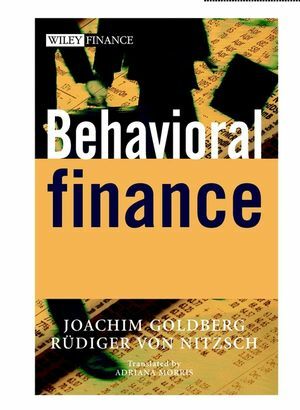 JOACHIM GOLDBERG worked for many years in a major German investment bank, specializing in behavioral finance. In 2000, he founded his own company called Cognitrend. RÜDIGER VON NITZSCH is Professor of Finance at the University of Aachen. His research centers on the decision manners of humans the the psychology of the stock markets. He has written a number of scientific books, journals and papers and is on the board of Axio. Forecasts: Fundamentals, Technical Analysis and Behavioral Finance. An Analysis of Exposure: Desire and Reality. Dams to Combat the Flood of Information: Strategies for Controlling Difficult Situations. Even the Evaluation of Gains and Losses. People Like to See Themselves in a Favorable Light: The Consequences of Psychological Needs. Everyone is Different: Three Types of Market Participant. Free Advice: Valuable Tips for Successful Trades.